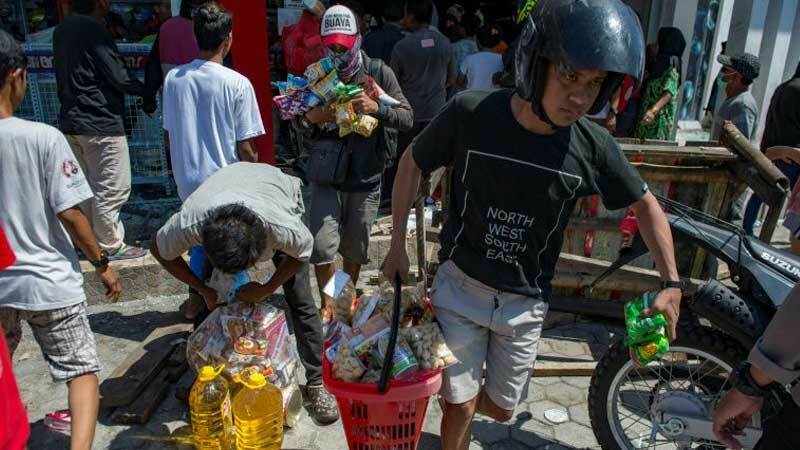 Hundreds of desperate people in the tsunami-struck Indonesian city of Palu looted supermarkets and petrol stations Sunday, as an initial trickle of aid into the devastated area failed to relieve an acute shortage of water, food and fuel. Hordes of residents on Sulawesi island were seen scrambling over broken glass and through broken-down barricades at a supermarket in the centre of Palu, which was ravaged by a powerful 7.5-magnitude quake and a tsunami on Friday. Men and women made off with plastic bin bags and baskets full of biscuits, crisps, nappies, gas canisters, tissue paper and more. “There has been no aid, we need to eat. We don’t have any other choice, we must get food,” shouted one man. “We are in a crisis,” cried another. But undeterred, more and more mopeds arrived, depositing people in front of the store. A handful of vastly outnumbered police officers stood by or looked on from the police station across the road — unable or unwilling to uphold law and order that has quickly melted away. There was a similar scene at a local petrol station where crowds tried to tap underground storage wells for fuel. They filled up jerrycans, empty soft drink bottles and kitchenware. “If you sell with reasonable price, that’s okay, but they increase the prices sharply, for basic goods,” said one female looter. Many Palu residents are still sleeping outside for fear of more aftershocks. Even if they had access to plug sockets, there would be no electricity. Some aid has started to trickle in to Sulawesi, located in the centre of Indonesia’s vast, 17,000-island archipelago. The government is flying in six field kitchens capable of producing a total of 36,000 rice plates a day and thousands of mattresses, blankets and ready to eat meals. But it is not coming quick enough for some. “The shops aren’t open and the markets are empty,” one 33-year-old looter, who only identified himself as Eddy, told AFP. Published in Daily Times, October 1st 2018.